corresponding author: Stephen R. Taylor. Published in The Astrophysical Journal, May 23rd 2018. We search for a gravitational-wave background (GWB) in the newly released 11-year dataset from the North American Nanohertz Observatory for Gravitational Waves (NANOGrav). While we find no significant evidence for a GWB, we place new constraints on a GWB from a population of inspiraling supermassive black-hole binaries, from a network of cosmic strings, and from a primordial GWB. For the first time, we find that the GWB upper limits and detection statistics are sensitive to the Solar-System ephemeris (SSE) model that we assume, and that SSE errors can mimic a GWB signal. We develop and implement a novel approach to model SSE errors, producing the first pulsar-timing GWB constraints that are robust against SSE uncertainties. In keeping with the principles of open science, we release the source code and data for our analysis, as well as a Docker image that can be used to reproduce it. Precision timing of millisecond pulsars over years and decades allows us to build models of radio-pulse arrival times of incredible accuracy. These models account for the pulsar's spin period, its evolution, the dispersion of radio pulses in the interstellar medium, and many other effects. 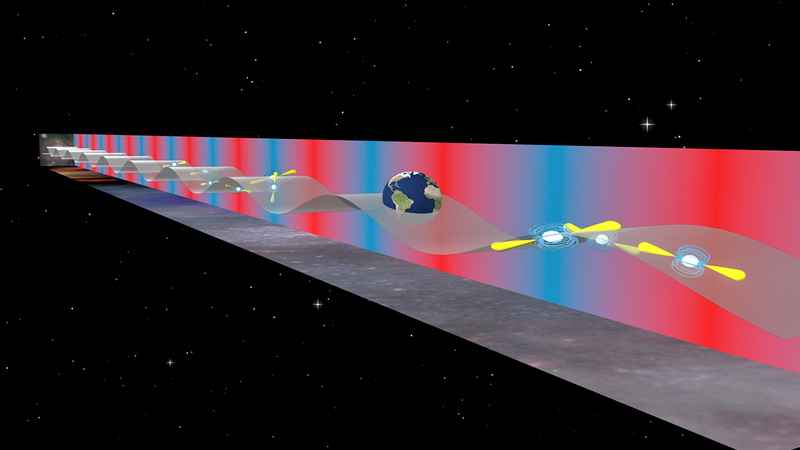 A gravitational wave (GW) propagating between the Earth and a pulsar will stretch and squeeze space-time between them. This causes alternating advances and delays of pulse arrival times with respect to our model's predictions. A random background of GWs will lead to apparent noise in the pulsar arrival times, with power predominantly at low frequencies. Such a background could come from many inspiraling supermassive black-hole binaries (SMBHBs), a network of cosmic strings, or space-time fluctuations of primordial origin. While random, this background affects all pulsars in the Milky Way with predictable correlations. We leverage this signature, correlating the pulse times of arrival from our large arrays of pulsars, to search for the common influence of GWs, interpreting results in terms of potential sources. NANOGrav's latest data release contains radio-pulse times of arrival (TOAs) and timing-models for 45 millisecond pulsars. Published in The Astrophysical Journal Supplement Series, April 9th 2018. The observations span 11.4 years, from July 30, 2005, to December 31, 2015. The pulsar with the longest baseline is J1744-1134, with 11.37 years of observations. The pulsar with the largest data volume is J1713+0747, with 27,571 TOAs. Observations were carried out using the 100-m Robert C. Byrd Green Bank Telescope (GBT) of the Green Bank Observatory, and the 305-m William E. Gordon Telescope (Arecibo) of Arecibo Observatory. In the sky map shown here, pulsar positions are marked by circles, with areas proportional to the number of TOAs in the dataset; the color scale indicates the timing baseline. The 34 pulsars with baselines greater than 3 years have solid red edges. We use only these 34 in our searches for a GW background. Image: sky map of NANOGrav pulsars. Image: Upper limit on a power-law stochastic background, as a function of spectral slope, and for different ephemeris choices. Our fiducial analysis treats the power spectrum of timing deviations caused by a GWB as a power law, defined by an amplitude (calibrated to a frequency of 1/year) and a spectral index. A GWB from a population of supermassive black-hole binaries (SMBHBs) has spectral index 4.33. We find that upper limits (shown here at 95% credibility) and signal-vs.-noise Bayes factors depend strongly on which Solar-System Ephemeris (SSE) we adopt. We consider a variety of SSEs from the Jet Propulsion Laboratory and INPOP ; Bayes factors vary by over an order of magnitude (from clear nondetection to promising feature) depending on the SSE. Hence, systematic errors in the SSE can mimic a GW signal. The most influential errors arise from the uncertainties on Jupiter's orbit, and from the correlated influence of Uranus and Neptune's uncertainties on Jupiter. These make it hard to locate the center of the Solar-System to the precision and accuracy needed for pulsar-timing GW detection. We have developed a scheme (BayesEphem) to mitigate these SSE errors, which is described below. Our scheme starts with a baseline ephemeris; we then construct an 11-parameter model that perturbs the position of the Solar-System barycenter (SSB). The model includes a drift-rate of the Earth's orbit about the ecliptic z-axis, mass perturbations of the gas giants, as well as linearized corrections to Jupiter's orbital elements (e.g., eccentricity, semi-major axis, etc.). These corrections are the dominant influence. BayesEphem yields consistent GWB upper limits and detection statistics, no matter which baseline SSE model we adopt (see image). Our fiducial GWB amplitude upper limit is 1.45 x 10−15 (when inter-pulsar correlations are modeled), and 1.34 x 10−15 (when they are not, as in previously reported limits). Signal-vs.-noise Bayes factors disfavor a GWB signal mildly; there is no evidence for the expected inter-pulsar correlation signature from GWs. Previous results from NANOGrav (and other PTAs) must be revised in light of the effect of ephemeris uncertainties. 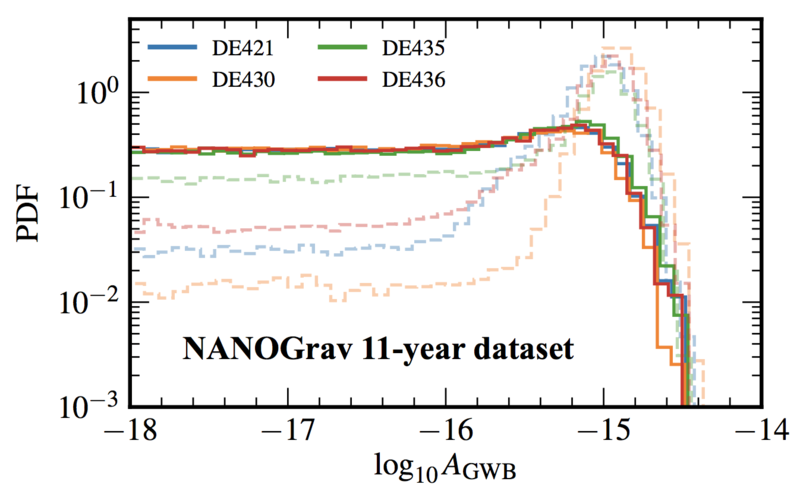 NANOGrav's 9-year Data Set upper limit is revised from 1.5 x 10−15 under DE421 to 2.67 x 10−15 with BayesEphem, without correlations; and to 2.91 x 10−15 with BayesEphem, with correlations. Image: Bayesian posterior probability density for the GWB amplitude at frequency of 1/year. Dashed lines correspond to adopting SSE models without accounting for errors, while solid lines of the same colors correspond to using BayesEphem with the same SSE as baseline. Image: (Top) Bayesian posterior probability distribution for galactic-core stellar density (y axis) and SMBHB eccentricity (x axis), at several fixed values of the y-intercept of the BH–bulge mass relationship. 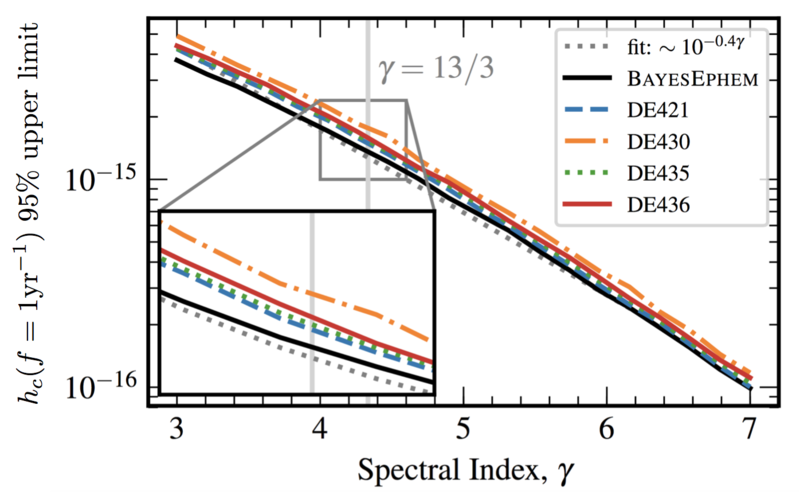 (Bottom) Translation of probability distribution to strain spectra. Larger y-intercept values give larger spectral amplitudes, since they require stronger environmental driving to attenuate the spectrum at low frequencies, and thereby avoid inconsistencies with the data. A GWB can be created from the incoherent superposition of GW signals from inspiraling SMBHBs throughout the Universe. These binaries form after massive galaxies merge, when their resident SMBHs sink together to the galactic nucleus and form a bound system. The fiducial characteristic-strain spectrum from such a SMBHB population is a power law with −2/3 spectral index. However, many processes can influence the amplitude and shape of this spectrum. SMBHBs can remain strongly coupled to their galactic environments even while they emit GWs at frequencies in the PTA sensitivity band. This causes the spectrum to deviate from a power law. Binary eccentricity can also cause spectral attenuation as power is distributed to higher orbital-frequency harmonics. We train a Gaussian Process to interpolate over GWB spectra from a grid of binary population simulations. We can the derive joint constraints on BH–galaxy scaling relationships, galactic-core stellar densities, and typical SMBHB eccentricities. This modeling scheme can be expanded to include many other dynamical and demographic properties. Cosmic strings are topological defects in space-time that could have formed when the early Universe underwent a phase transition. Networks of these long strings can intersect, chopping off small loops that vibrate relativistically and decay via GW emission. 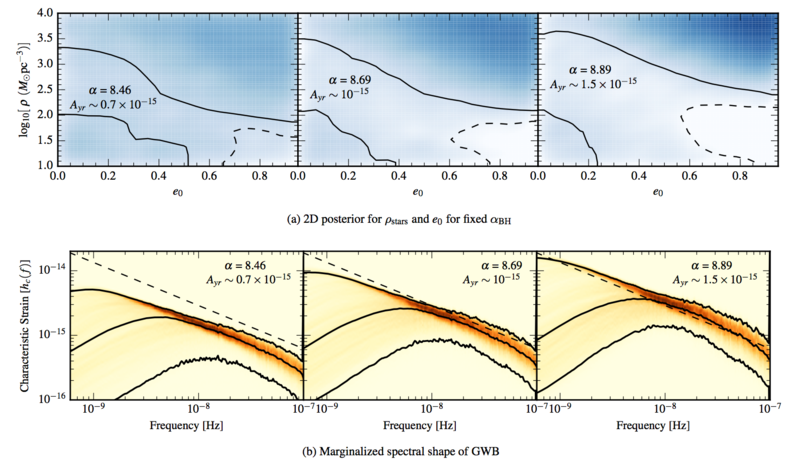 Higher string tensions (large x-axis values in the image here) yield stronger GW emission. The strings predicted in quantum field theory always intersect when they meet. In contrast, cosmic superstrings do not always intersect when they meet in 3 dimensions because they may miss each other in higher compactified spatial dimensions and/or because they interact probabilistically. Their intersection probabilities can therefore be less than unity and are shown on the y-axis in the image here. We train a Gaussian Process to interpolate over spectra from the most up-to-date cosmic-string simulations, allowing us to constrain string tension at different intersection probabilities. 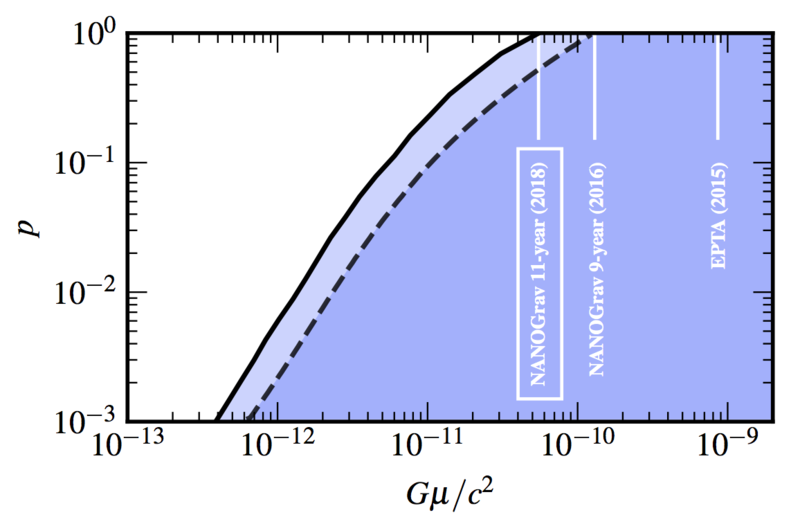 Our modeling scheme and constraints improve on the NANOGrav 9-year and most recent EPTA results. Our upper limit on the cosmic-string tension at an intersection probability of one is 5.3 x 10−11. At this level, cosmic-string signatures are unlikely to be seen in the CMB power spectrum or through other means. PTAs continue to be the best tool for probing cosmic strings. Image: The solid black line enclosing a blue region denotes the parameter space excluded by our analysis to 95% credibility. 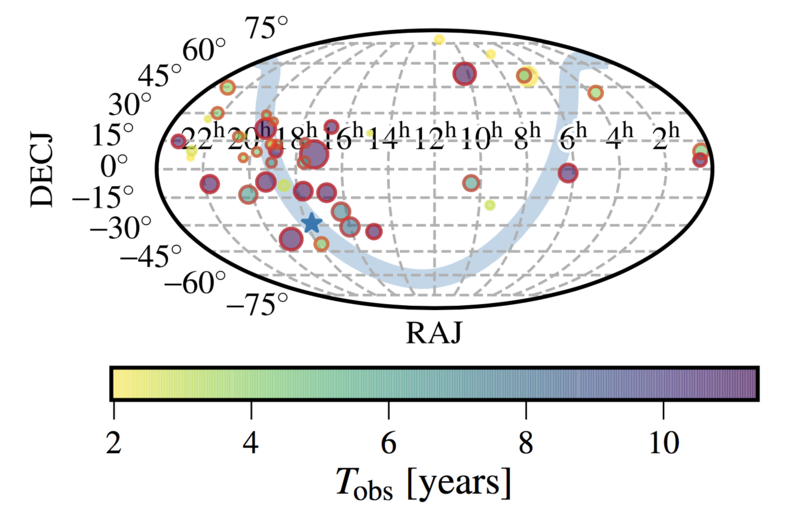 Dashed lines enclosing a blue region show similar constraints for the NANOGrav 9-year analysis, while the most recent EPTA result is indicated at p=1. Table: 95% upper limits on the amplitude of a primordial GWB (at a frequency of 1/year). Different models for the inflationary equation of state are assumed depending on whether matter, radiation, or kinetic-energy dominated the Universe at that time. The analysis is repeated for different SSE models, and under BayesEphem. Quantum space-time fluctuations in the very early Universe may have been amplified to cosmological scales by the process of inflation. This creates a background of primordial GWs. Current experiments search for signatures of this background in the polarization properties of the CMB, through so-called B modes, at very long wavelengths (of order the size of the Universe when the CMB was formed). GW instruments such as PTAs may allow the detection of these primordial GWs at much shorter wavelengths, providing unparalleled insight into early-Universe cosmology. We place limits on the amplitude of a GWB (at a frequency of 1/year) for a variety of assumptions on the dominant content of the Universe during inflation. For radiation-dominated inflation, the Hubble-independent energy-density of the Universe (as a fraction of closure density) is constrained to 3.4 x 10−10. 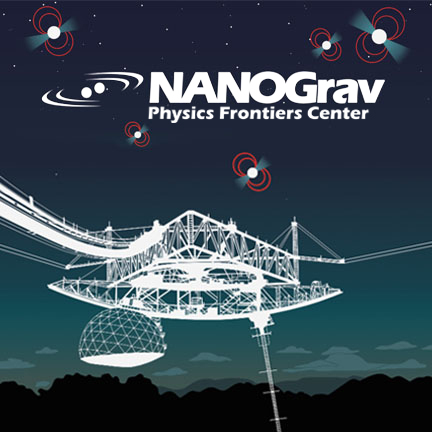 Contact: Dr. Stephen R. Taylor (corresponding author), Prof. Maura McLaughlin (NANOGrav chair). © NANOGrav 2018. All rights reserved. Design: HTML5 UP.